Those who keep track of estate markets know that they run in cycles of good times, not-so-good times and sometimes downright depressing times, like what the markets experienced following the 2008 economic recession. But the Triangle housing market has been in a pretty strong recovery mode for a few years now. Is it time to start preparing for the market’s peak and impending downturn cycle? A bell curve chart of the 20 largest new home volume markets in the U.S. shows that more than half are still in an “expansion” phase. Well, not quite yet, according to a research note by the John Burns Real Estate Consulting firm. Its report, released Thursday, shows a bell curve chart of the 20 largest new home volume markets in the U.S. with the Raleigh market falling somewhere in about the fifth inning of a nine-inning game, to use the baseball game analogy. “Raleigh is one of the Southeast markets that a lot of builders entered and scaled up on during this recovery, which is why we have it a bit higher than Charlotte and much higher than Atlanta,” says Rick Palacios Jr., director of research at John Burns Real Estate Consulting. Home values in Raleigh, he says, are already 13 percent above their prior peak, whereas in Atlanta home values are still about 1 percent below its market peak. Charlotte home values are about 8 percent above market peak, whereas the new home market in Nashville, Tennessee, has been “growing gangbusters” with home values 28 percent above prior peak, Palacios says. 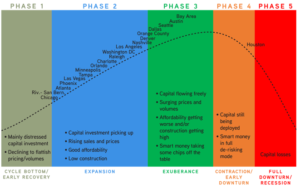 The report shows that about a dozen of the largest new home markets, including all that were mentioned above, are in what Palacios describes as “phase 2” or expansion phase of a five-phase housing cycle: Capital investment is picking up, homes sales and prices are rising, there’s good affordability and moderate construction.